Thanks to Dr. Saroona Haroon, Aga Khan University Hospital (Pakistan) for contributing this case. To contribute a Case of the Week, follow the guidelines on our Case of the Week page. (2) This is our Annual Appeal for The Detroit College Promise, the charity we created. In September, we merged with the Detroit Public School Foundation, because it is a stronger organization and can generate a bigger impact for The Detroit College Promise. Dr. Pernick was appointed to its board, and is working to grow the program in its new setting. The Detroit College Promise is continuing to award scholarships to Detroit Public School students to inspire them to make education a priority. To date, we have awarded 648 scholarships, totaling $252,660, and helped these students get $6.5 million in grants for their first year of college. Last year, we raised $3,300 from Pathologists, and this year, our target is $5,000. I hope you can help. We as pathologists know the importance of education, but many others do not. During the past 7 years, we have found that for many students, telling them that they have a guaranteed scholarship is a profound shock, and makes them take their education much more seriously. Your contribution makes the difference! Thanks for your support! 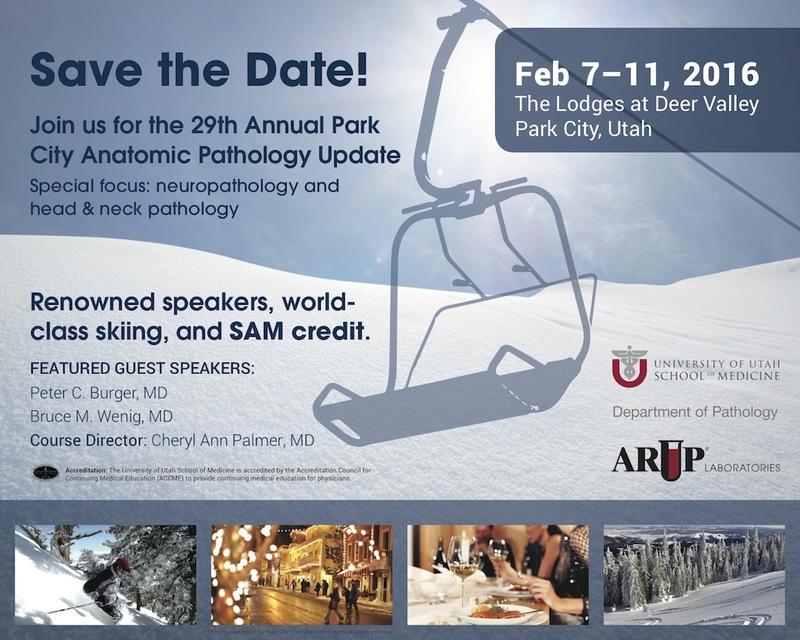 Please contact Dr. Pernick with any questions. The Detroit Public School Foundation is a 501(c)(3) tax exempt non-profit. Your contribution is tax deductible as allowed by law. A 3 year old boy with a history of an allogenic bone marrow transplant 32 days previously presented with abdominal pain, mild weight loss and diarrhea. 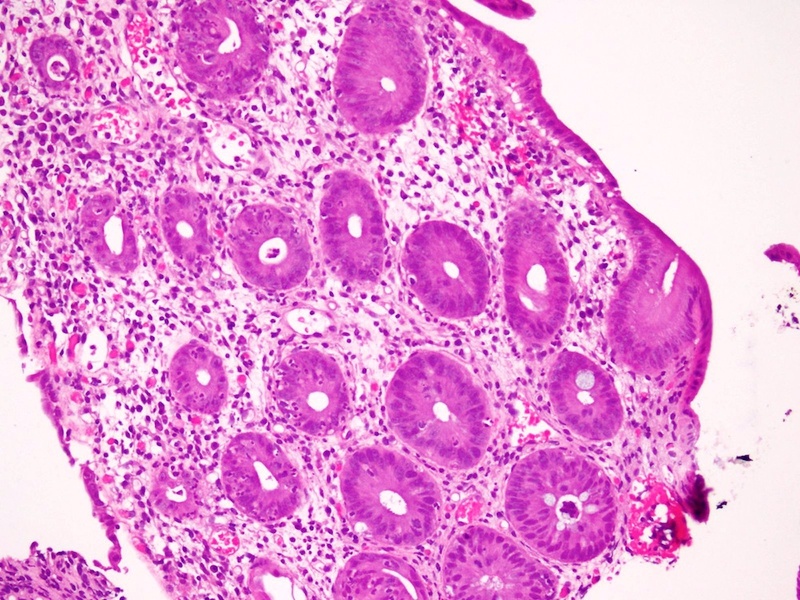 The clinical impression was CMV colitis. A colonic biopsy was obtained. Acute graft versus host disease (a-GVHD) involving the GI tract develops in up to 50% of allogeneic bone marrow (BMT) transplant recipients, and is a significant cause of morbidity and mortality. It frequently involves the skin, intestinal tract and liver. The incidence ranges from 30-60%, with skin the most commonly affected organ. Symptoms which point to GI tract involvement include diarrhea, crampy abdominal pain, hemorrhage, anorexia, nausea and vomiting (Odze & Goldblum: Surgical Pathology of the GI Tract, Liver, Biliary Tract and Pancreas, 2014). The symptoms are not specific, however, and could also be caused by chemotherapy effect, radiation therapy effect, infections and side effects from other drugs (BMC Gastroenterol 2003;3:5). 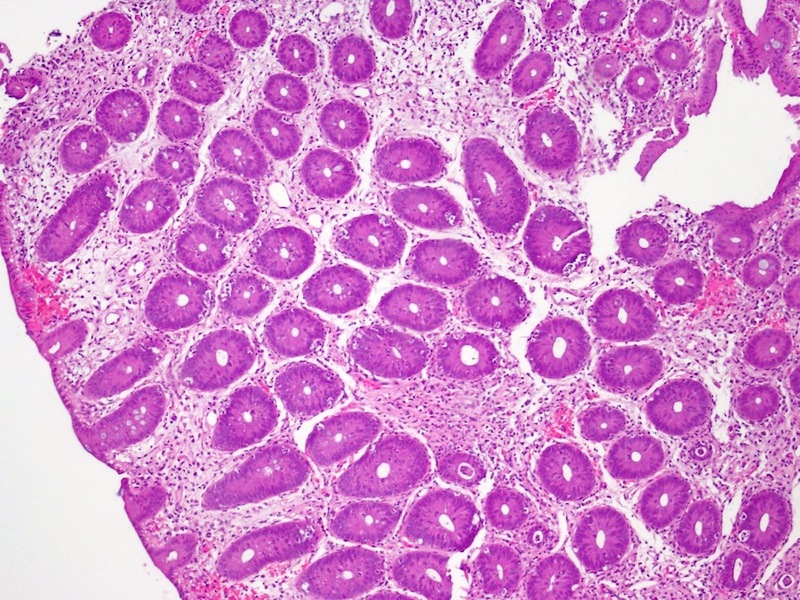 Furthermore, the histologic features of these conditions overlap significantly with those of a-GVHD; therefore, interpretation of colonic biopsies in this setting can pose a major diagnostic challenge. Findings on endoscopy are variable and may include mucosal edema and erythema, or ulceration and mucosal sloughing. 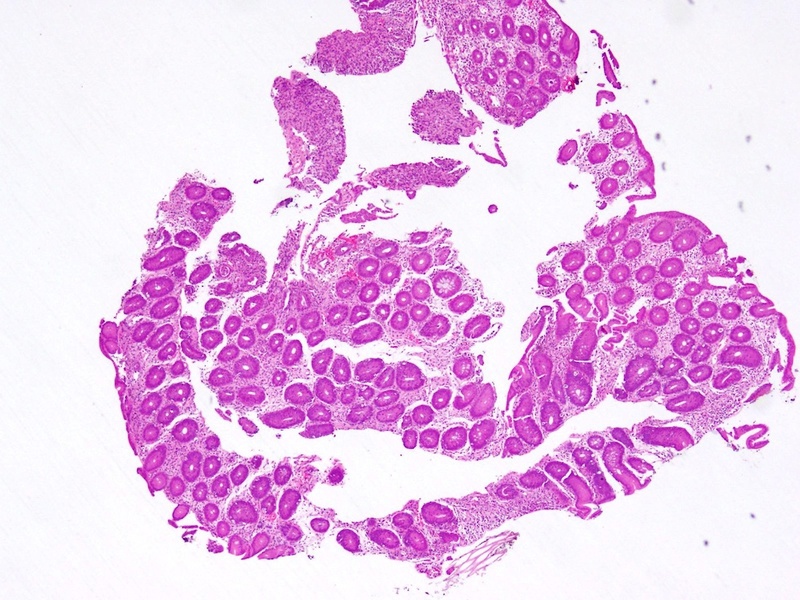 Endoscopic findings do not correlate well with histopathologic findings, and visible lesions are found in a minority of cases (16-32%, Gastrointest Endosc 2006;64:379). 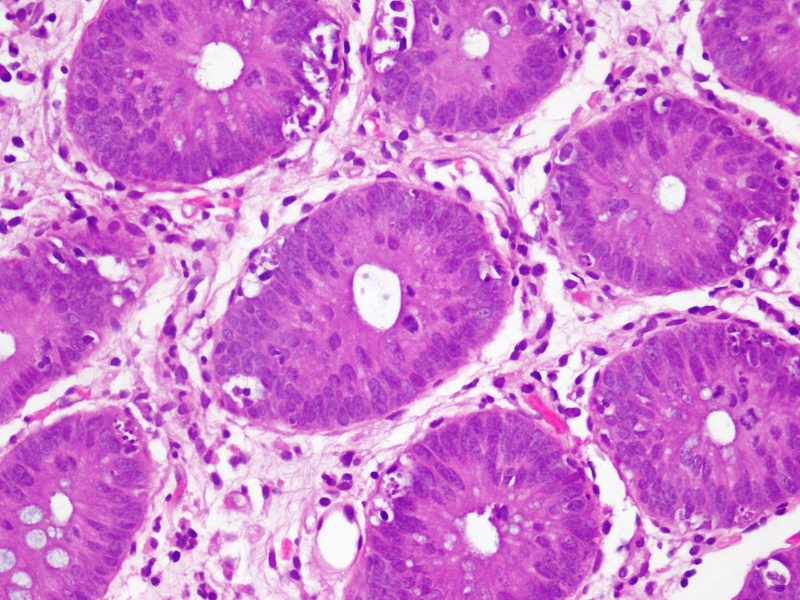 Histopathology shows crypt cell apoptosis combined with a relatively sparse mononuclear inflammatory cell infiltrate (Fig 4, Fig 6). 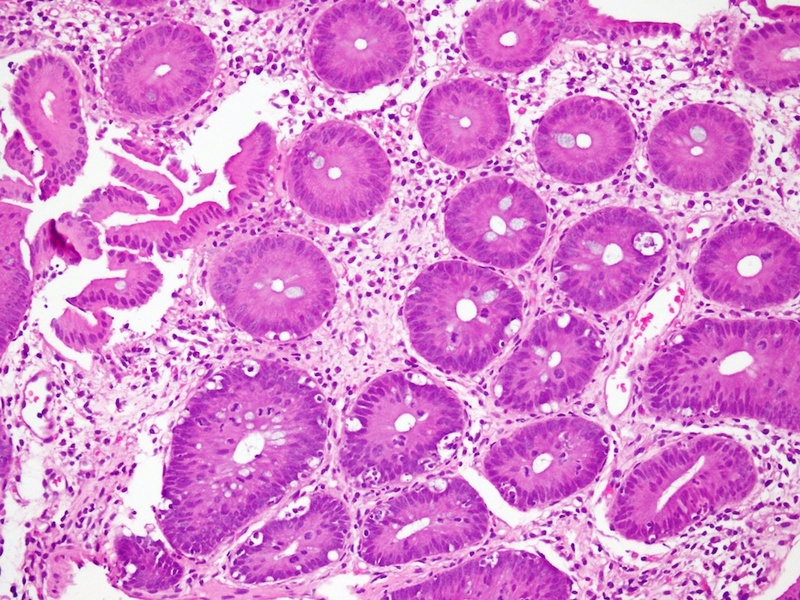 Apoptoses are found primarily in the regenerative compartment of the mucosa, such as the deep crypts of the colon (Surgical Pathology of the GI Tract, Liver, Biliary Tract and Pancreas, 2014, Fig 11). 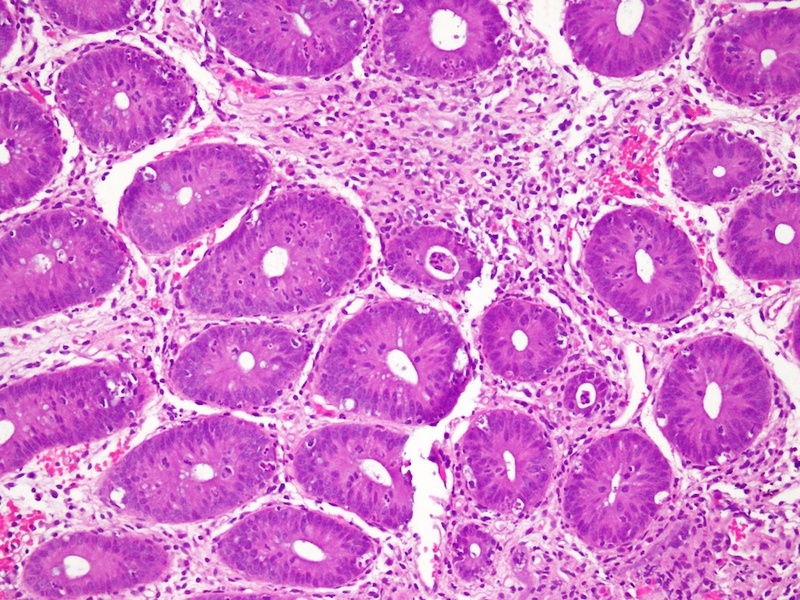 These cells, which contain intracytoplasmic vacuoles filled with karyorrhectic nuclear debris, are quite conspicuous and have been labeled variously as "exploding crypt cells", "granular necrosis", and "popcorn lesions" (BMC Gastroenterol 2003;3:5, Surgical Pathology of the GI Tract, Liver, Biliary Tract and Pancreas, 2014, Fig 12). 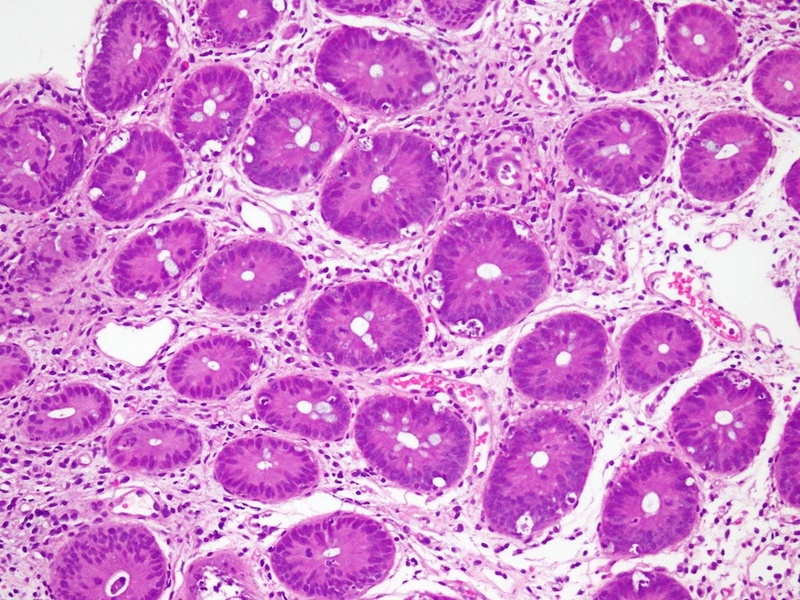 In severe cases, crypt abscesses and frank epithelial destruction are seen (Hum Pathol 2009;40:909). Findings may be focal and patchy, and some studies recommend 8 serial sections to avoid false negative results. Use of immunohistochemical stains such as activated caspase 3 for apoptotic bodies is not recommended (Biol Blood Marrow Transplant 2006;12:31). 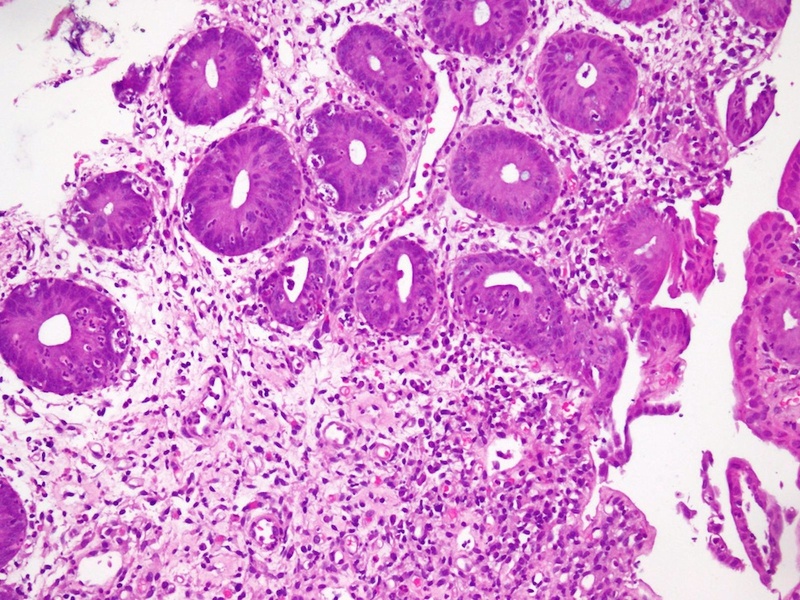 Identifying even 6 or fewer crypt apoptotic bodies in colon biopsies from BMT patients is worth reporting in order to alert the clinicians of the possibility of GVHD, but not sufficient for a diagnosis of GVHD on pathologic grounds alone (Am J Surg Pathol 2013;37:539). It has been suggested to classify this group as "indeterminate" for GVHD (Am J Surg Pathol 2013;37:539). In general, histologic grade does nor correlate well with endoscopic findings or clinical features (Hum Pathol 2009;40:909). Similar changes may be seen in a variety of conditions, and thus the differential diagnosis is broad. 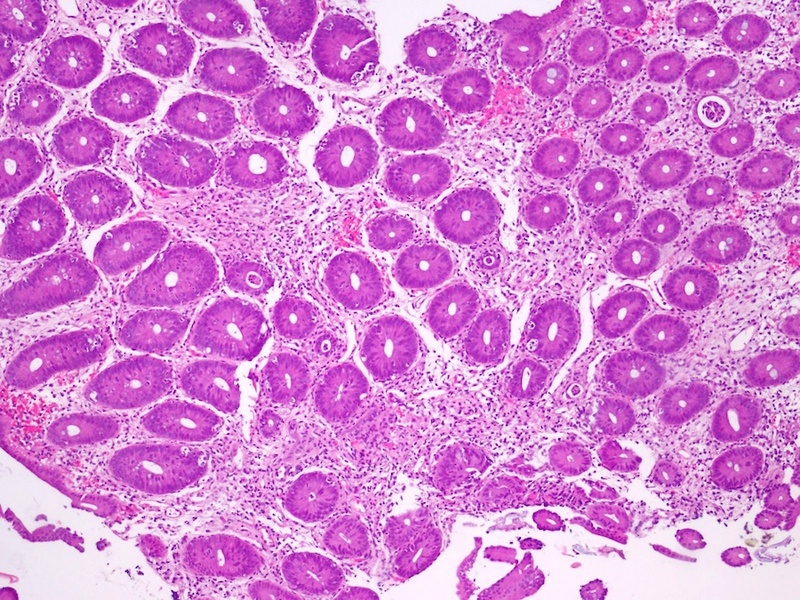 Severe T cell deficiencies, malignant thymoma, proton pump inhibitor therapy, bowel preparation effect, AIDS enteropathy, recurrence of acute lymphoblastic leukemia, CVID and CMV infection can cause similar effects (Surgical Pathology of the GI Tract, Liver, Biliary Tract and Pancreas, 2014). Demonstration of viral inclusions would point to a diagnosis of CMV infection; however, acute GVHD and CMV infection may occur simultaneously. 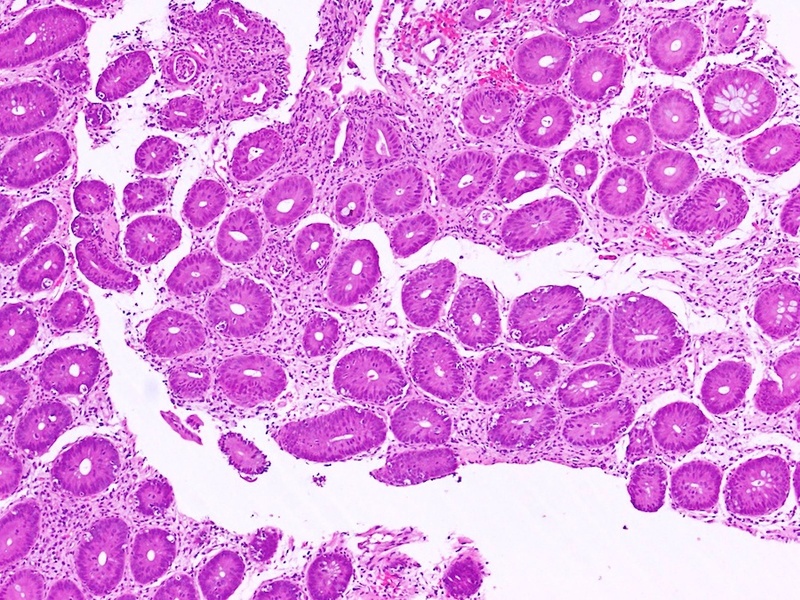 Features that favor a diagnosis of acute GVHD include severe crypt destruction, the absence of mixed acute and chronic inflammation, absence of ischemic changes and the preservation of enterochromaffin cells at the base of the mucosa (J Clin Pathol 1991;44:866). If these findings are present and only scattered CMV viral inclusions are identified, then GVHD is likely the major cause of tissue injury. Because the effects of cytoreductive therapy in the setting of bone marrow transplant resemble GVHD in the early post-transplant period, a diagnosis of GVHD should be made with caution within 21 days after transplantation (Surgical Pathology of the GI Tract, Liver, Biliary Tract and Pancreas, 2014). 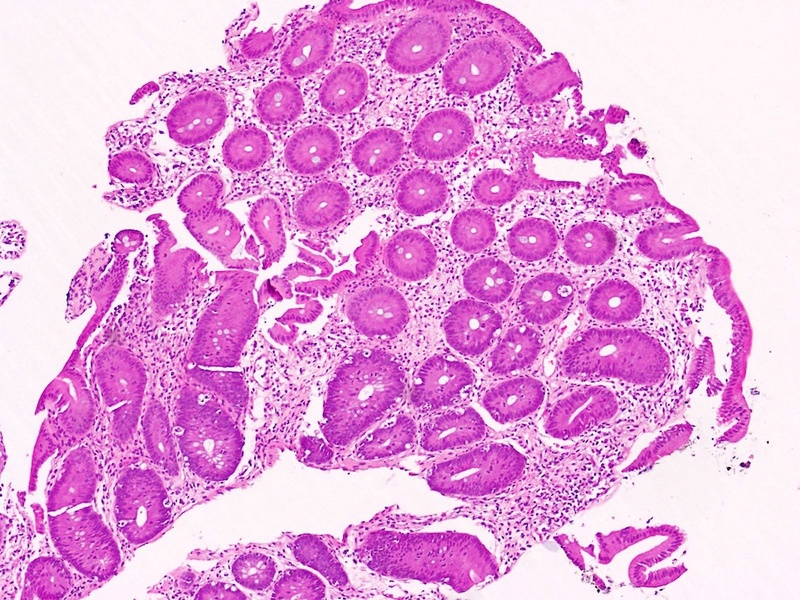 Because the diagnosis of GVHD relies upon synthesis of clinical, histologic and laboratory findings, it is critical that pathologists work closely with clinicians to establish the diagnosis in the GI tract. 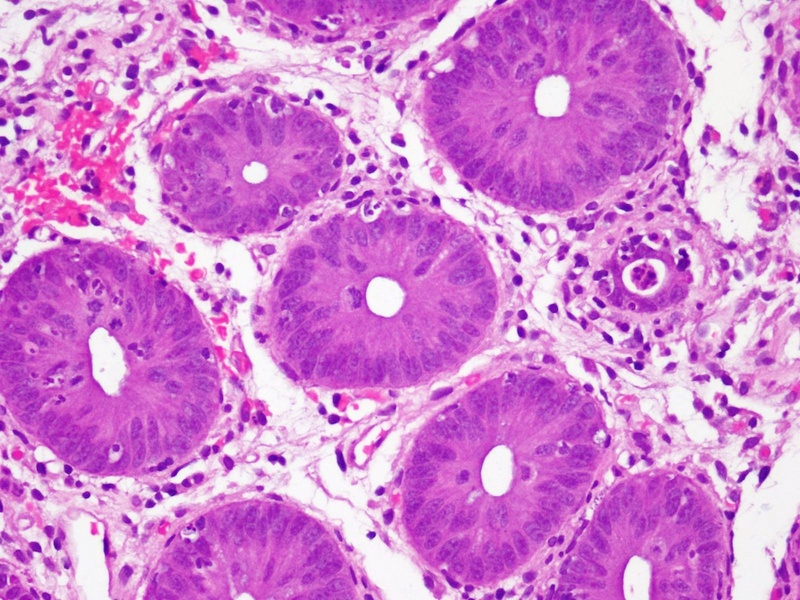 Knowledge of the timing of biopsy after transplantation, drug regimens, suspected infections, and clinical and biopsy findings in other organ systems such as skin and liver can be key to making the diagnosis and avoiding misinterpretation of subtle histopathologic findings (Hum Pathol 2009;40:909). Systemic steroids are the first line therapy for GVHD. Infliximab or oral budesinude are helpful in patients with steroid refractory disease, particularly in those with gastrointestinal tract involvement (Curr Opin Gastroenterol 2005;21:64). About 50% of patients will have a solid response to steroid therapy, and about 50% of patients with a-GVHD will eventually have manifestations of chronic GVHD (Orphanet J Rare Dis 2007;2:35).